I went it to this not knowing much about Vision and I regret that now. This was amazing and I need to read the next five issues. There were a lot of themes present in these five issues that attracted me to the X-Men when I was younger. Vision was awesome, but I found myself relating to Viv and Vin's struggle to fit in at their school more easily than I could Vision or Virginia. 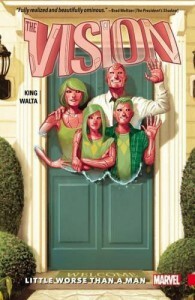 The story starts off with Vision and his family moving to the suburbs of Washington, D.C. They struggle to fit in and build a life there. One horrible moment with the Grim Reaper torpedoes their attempt. It sets off an avalanche and the happy life Vision has built with Virgina, Vin, and Viv is snatched away. 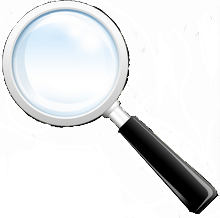 None of this comes as a surprise to the reader; the narration throughout sets you up for the downhill slide and the way their neighbors and classmates treat them is a dead giveaway that there is no happy ending.